We’re going through a little creative snack phase at our place. It all started when we made a healthy platter of fruit, veg & cheese ‘flowers’ a few weeks back. 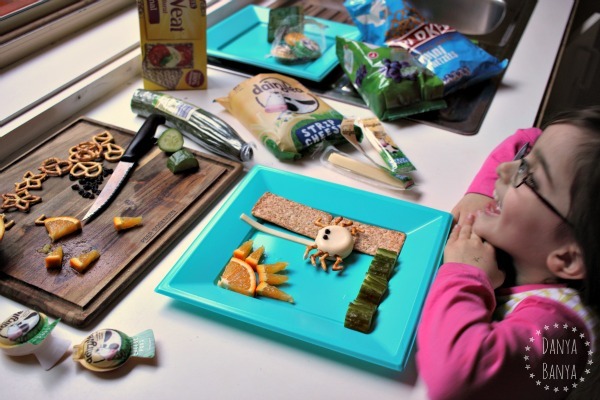 Ever since then, the kids have been begging for ‘picture snacks’, and we’ve had lots of fun coming up with different ideas. Use your knife to make tiny incisions in the cheese wheel for the legs and eyes, and then push in eight pretzel legs and the two smallest currants for eyes. Cut a thick slice of orange into quarters, using one quarter for the sun. Cut a second quarter into tiny segments and add as sun rays. Two rectangular crackers stacked vertically can act as a spout, and a cheese strip can act as a long spider web. Then just add some thinly sliced cucumber grass, and you have a cute (and healthy) little Incy Wincy / Itsy Bitsy Spider snack! Yum! Make an pipe cleaner Incy Wincy Spider like this one from Teach Me Mommy. 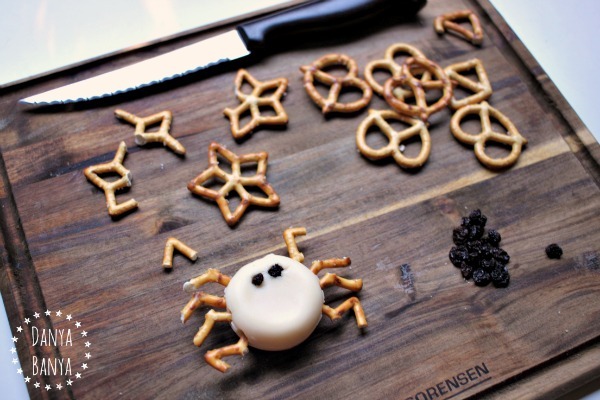 Or try an Incy Wincy Spider biscuit snack from Messy Little Monster. You can find all these ideas and more on our Rhyme Time pinterest board. 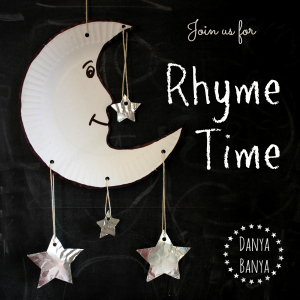 Follow Danya Banya | Go Science Girls’s board Nursery Rhyme Time!! on Pinterest. 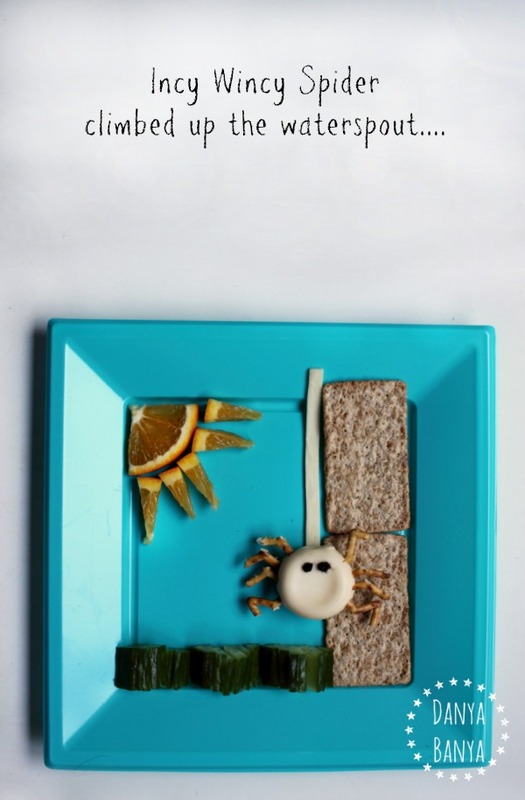 Speaking of Pinterest, you might also like our Fun & Healthy Snacks for Kids pinterest board. I’m always adding great ideas I find around web over there. 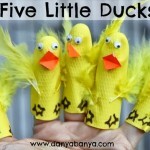 And of course, there’s our Danya Banya board, which has all the fun activity posts from this blog. 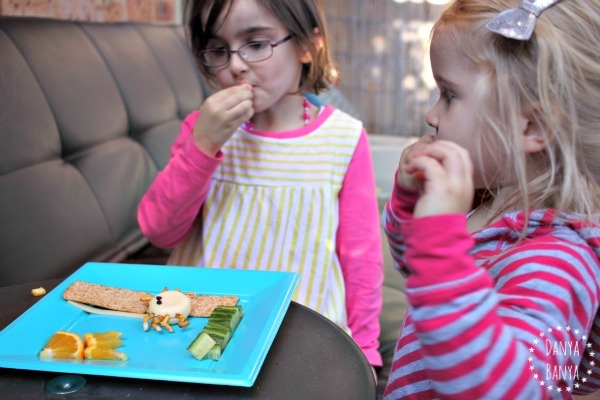 Follow Danya Banya | Go Science Girls’s board Fun and healthy snacks for kids on Pinterest. 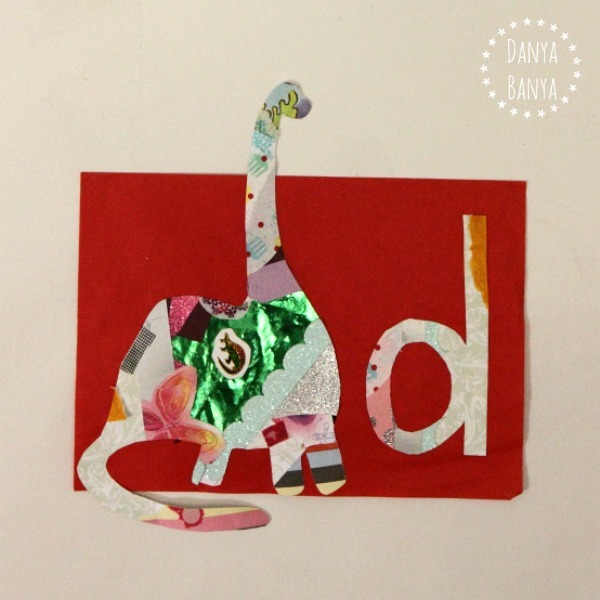 Follow Danya Banya | Go Science Girls’s board Danya Banya on Pinterest. 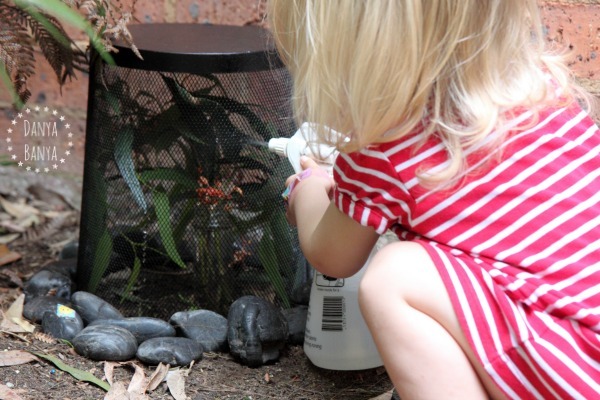 Make a fun DIY bug hotel (or insect habitat), and encourage kids to consider where bugs fit into the backyard ecosystem. 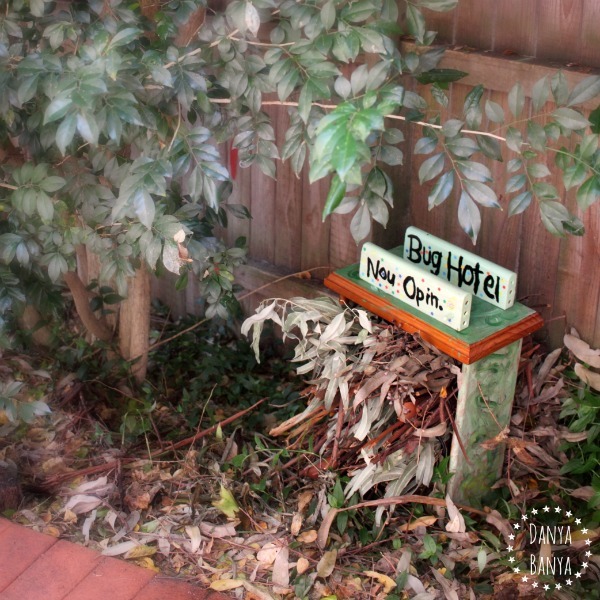 We’re a nature loving household, so having a backyard bug hotel doesn’t seem at all weird to us. Haha! But if you’ve never heard of these before, do a quick google search, and you’ll find DIY bug hotels or insect habitats in all shapes and sizes. The idea is to provide a sanctuary for various insects to nest or hibernate, and encourage a diversity of insects in your backyard. 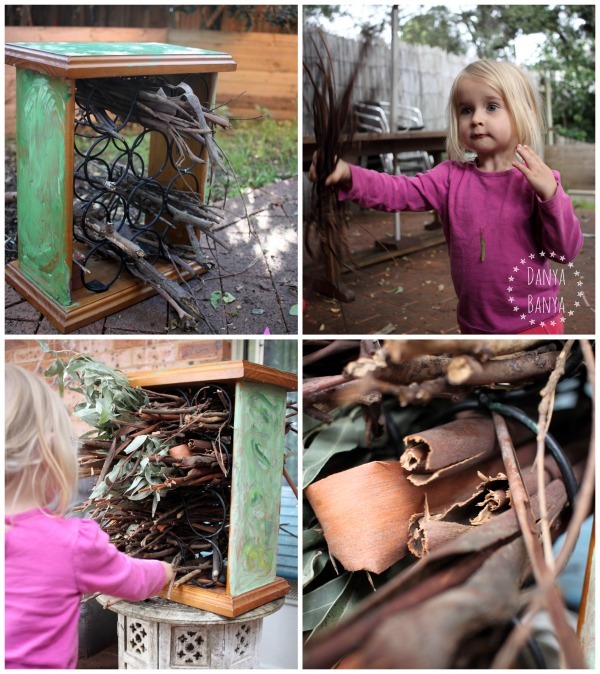 When my kids heard that bug hotels were “a thing”, they couldn’t wait to make one. We had an old wine rack gathering dust in the garage that I thought would make the perfect skeleton. 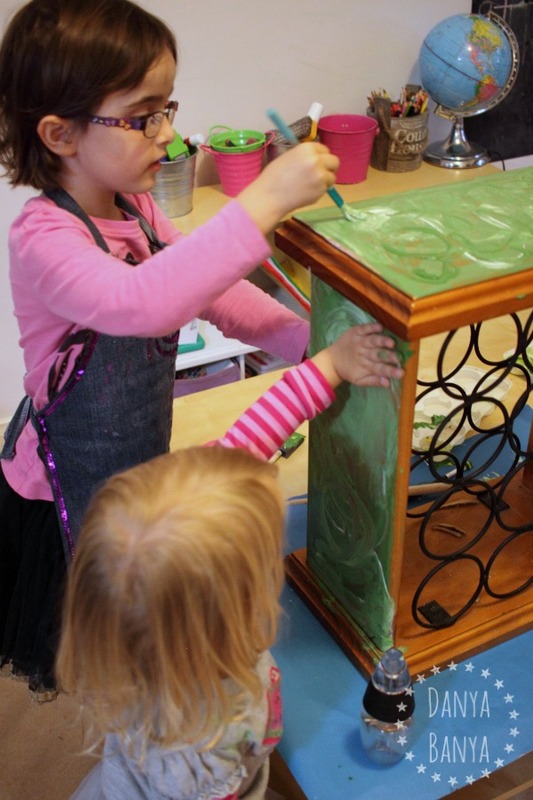 The kids and I painted it with acrylic (oil-based) paints in swirls of green, white and silver. (Note: We used acrylic paints, which are oil-based paints that won’t wash off in water once dry. This is very important if your bug hotel will be set up outdoors where it will be exposed to rain). When they were dry, she decorated them with stickers. I also painted “Insect Habitat” and “Welcome” on the back of the signs, in case the bug hotel is viewed from the other side. I stuck these on with wood glue once the bug hotel was filled. When the rain subsided, Bee and I headed outside to collect sticks, bark and leaves to fill our hotel. It took a few sessions, as collecting sticks is hard work for a 2.5 year old! 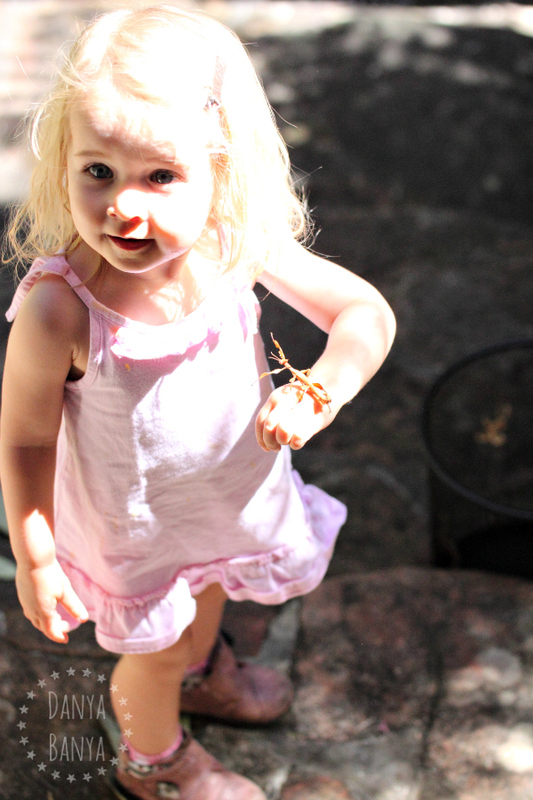 But luckily the gum tree in our backyard drops plenty of ‘leaf litter’, which made most of the gathering easy. The wine rack holes were really convenient, as we could fill each section, without needing to worry about the whole lot falling apart. We started off filling a few of the wine rack holes with sticks. Next we filled a few holes with fallen bark which, incidentally, has a natural hollow shape that I imagine would make a really comfy home for a little insect. 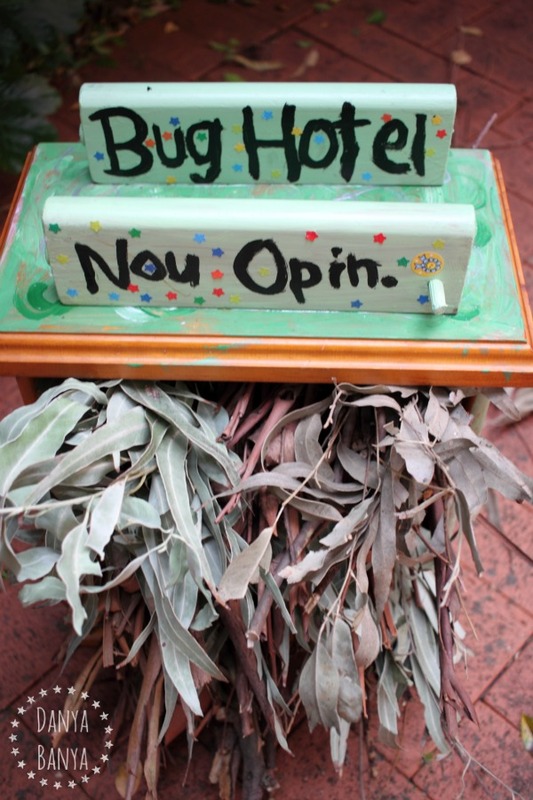 And finally we filled the rest with branches of old gum leaves (left over from feeding our pet phasmids). While we were building our bug hotel, a green leaf hopper landed on it, much to the kids delight. Our first resident! I wonder who else will move in?? Many ‘more professional’ insect hotels you can find online are designed as habitats for specific insects. Some insects prefer different materials, holes drilled to different diameters, etc. Ours is not that fancy. It’s more of a “if you build it, they might come” sort of bug hotel. But I figure that local insects will probably (hopefully) like our selection of local materials, and that being off the ground will provide shelter from the blue tongue lizards. And at the very least, as a toddler and kindergartener activity, it is encouraging my kids to consider and learn about nature though play. 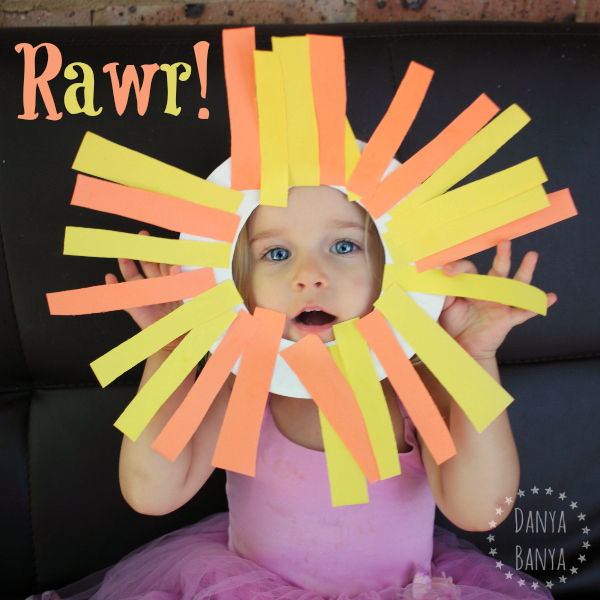 Easy paper plate lion mask craft for kids – that toddlers (and up) can make. Super cute too! Rawr!! 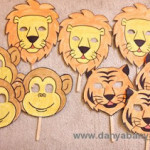 Isn’t this toddler-made lion mask just the cutest thing ever! Bee made it back in March, when she was 2.5 years old. 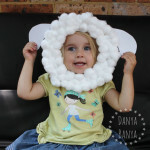 This craft was her idea actually – she came up with the idea to make a paper plate lion mask, after we made a similar paper plate sheep mask a few weeks earlier. 1. Cut the centre out of the paper plate. 2. Stick double sided sticky tape all around the paper plate rim. 4. 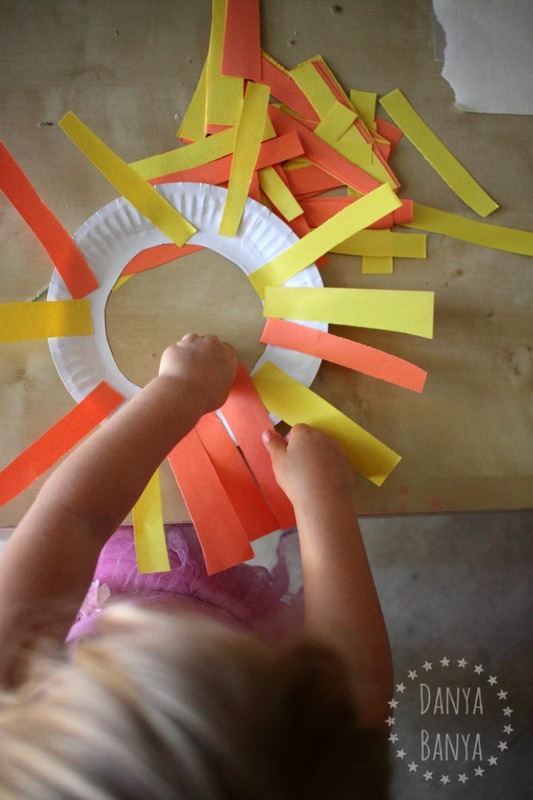 Encourage the kids to stick strips around the edge of the paper plate, so that they are sticking ‘outwards’ instead of ‘inwards’. Or if you are looking for other paper plate animal ideas, we made some super cute paper plate pandas a little while back too. 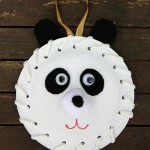 I think I may becoming addicted to paper plate animal crafts – they are just so adorable!! 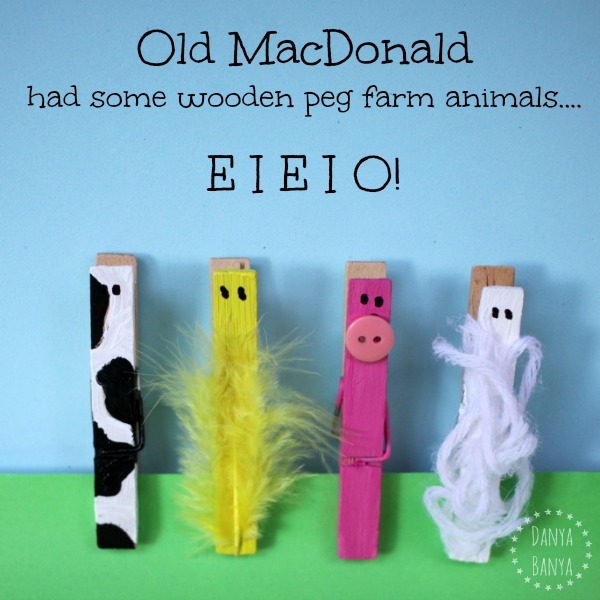 Make your own peg farm animals. Perfect for singing Old MacDonald Had A Farm, or farm themed play. Can you tell how much fun we’ve been having with this nursery rhyme series? So far we’ve had Hickory Dickory Dock, I’m a Little Teapot, Little Bo Peep, and Mary Mary Quite Contrary. And this week, it’s time for Old MacDonald had a Farm…. This little recycled paper dinosaur has been sitting up on our wall for over a year. He was never intended to be a blog post, but he makes me smile, and that’s a good enough reason, if ever there was one. JJ and I made him together. She was about 3.5 years old or so at the time, and starting to learn some letters. 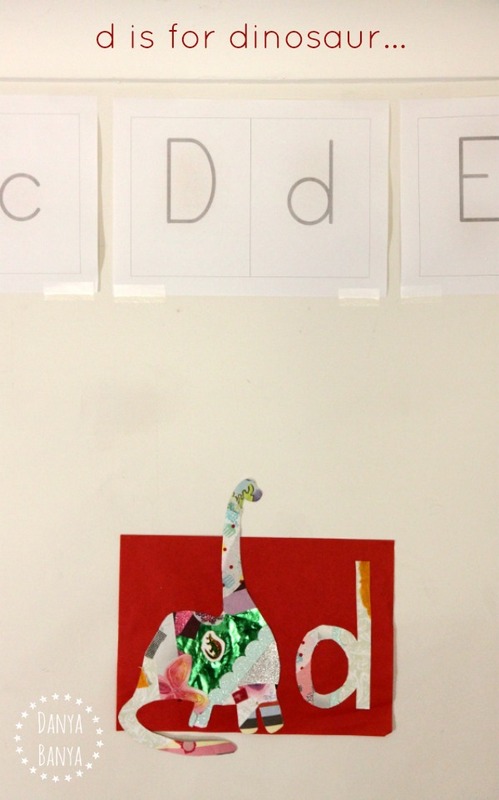 When JJ saw it, she said “b is for brachiosaurus”. Haha! I should have realised that ‘dinosaur’ would be too generic for my little paleontologist. And that’s where it’s been for the past year. Reminding me of my spunky little girl before she knew her letters. The specific one. The one who thinks of brachiosaurus before she thinks of dinosaurs. 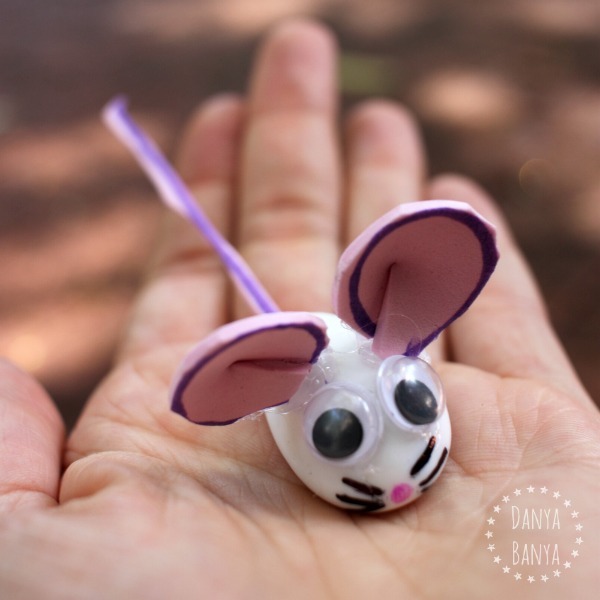 Make a cute pebble mouse (or pebble mice!) 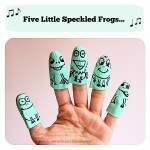 for imaginative play. 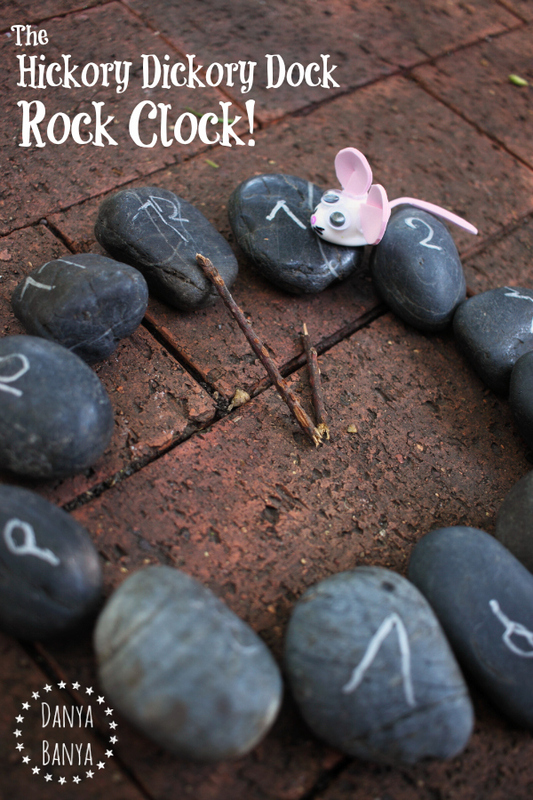 Or have one run up a simple rock clock for some Hickory Dickory Dock nursery rhyme fun. I prefer my low temperature glue gun for this sort of project to protect my fingers, but if you are better at avoiding burns than I am, then a hot glue gun would work just as well. The first step is to cut a tail (either straight or curved). Then cut two little circles for the ears, with a radial cut in each one. 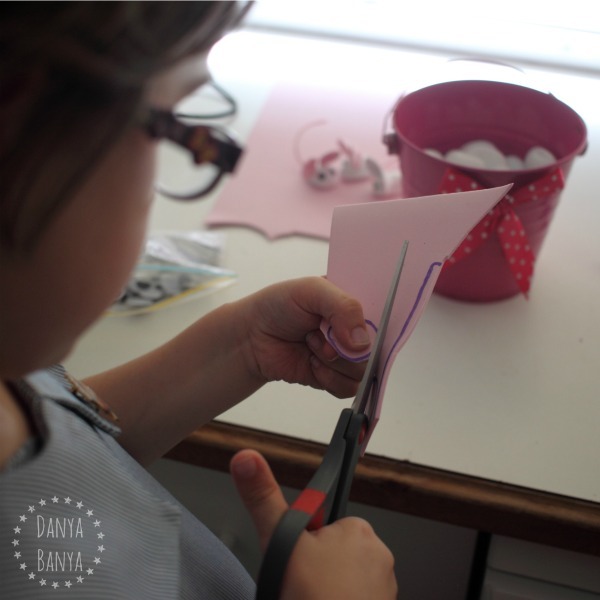 Add a drop of glue to one side of the cut, and then bring the other side on top of the glue to make a slight cone shape. Trim any overlap with scissors if necessary. Glue on the googly eyes, leaving enough room to add a nose and whiskers later on. Larger googly eyes look cuter I think! Lastly draw on the nose and whiskers using permanent marker. 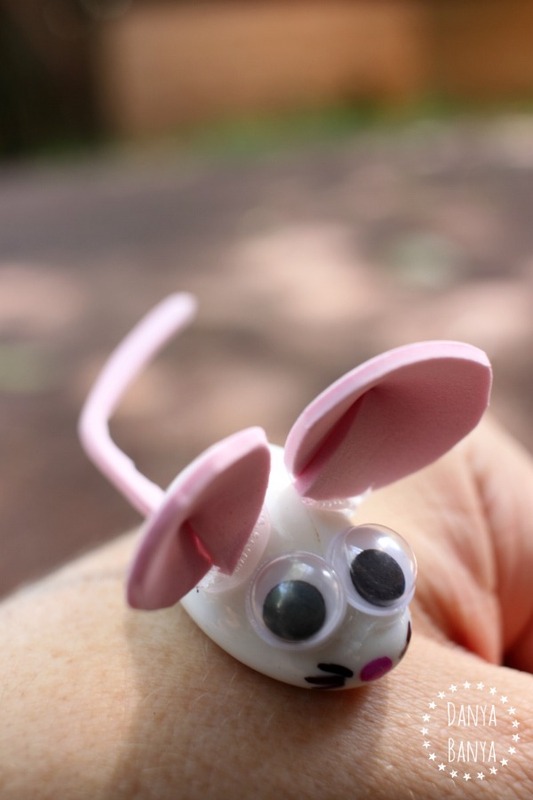 And there you have a cute little pebble mouse! 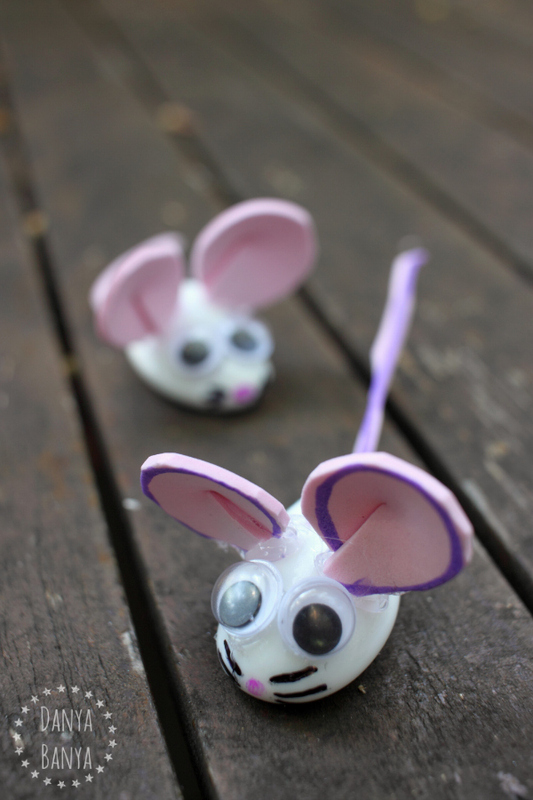 Kids can help make pebble mice too. I drew circles and a line on some craft foam, so that JJ (4.5 years old) could cut the shapes out. (Great cutting skills practise). I took over for the gluing and drawing part, but JJ still sees this one as being ‘her’ pebble mouse. Doesn’t the purple line add definition! But I will warn you though: they didn’t last very long around my 2.5 year old daughter Bee. She loved them – or maybe I should say she loved to destroy them. Her whole play revolved around picking off the ears, eyes and tails. Poor pebble mice! Alas, maybe I’ll make some more when Bee’s out of her ‘terrific twos’. * This post contains Amazon affiliate link(s). An affiliate link means I may earn a commission if you make a purchase through my link, without any extra cost to you. It helps to keep this little blog afloat. Thanks for your support. 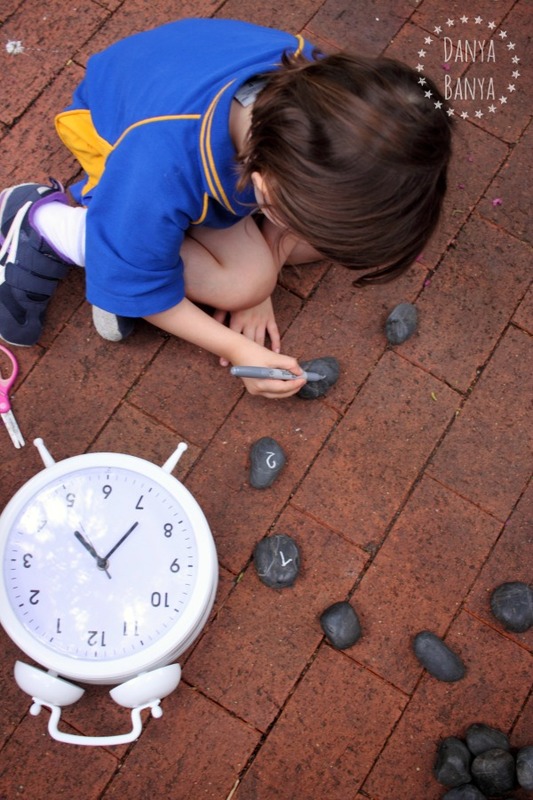 The Hickory Dickory Dock Rock Clock! 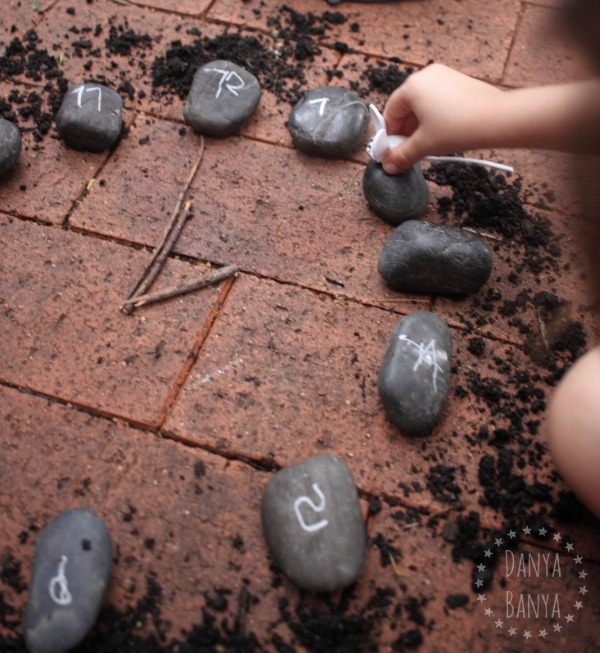 Make a rock clock as a fun Hickory Dickory Dock nursery rhyme activity for kids, for a fun hands on way to practise writing, numeral recognition and clock reading skills through play. This is the first post of a brand new series called Rhyme Time! 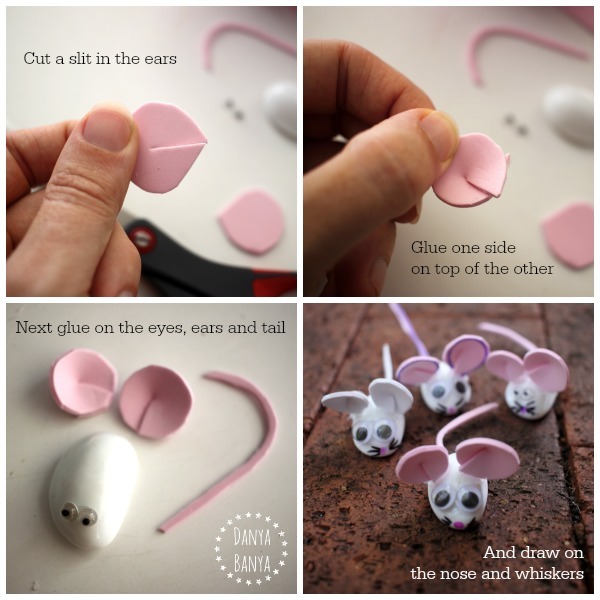 I’m so excited to be joining some really lovely bloggers in bringing you a bunch of nursery rhyme extension crafts and activities for all your favourite nursery rhyme songs. Yay!! The first nursery rhyme off the chopping block is a favourite of mine: Hickory Dickory Dock. I’m not sure if these are the ‘official Hickory Dickory Dock lyrics’, but this is what we sing at our place anyway. 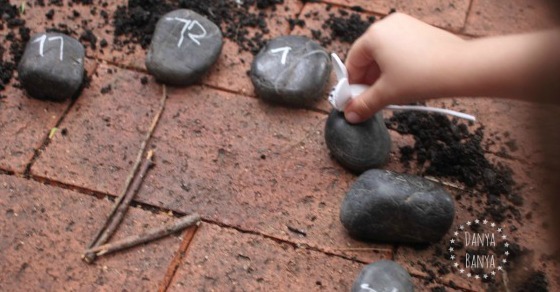 To make our rock clock, my 4.5 year old daughter JJ wrote the numbers 1-12 on dark grey rocks from our garden, using a metallic silver Sharpie permanent marker. (Metallic gold markers also work well on dark coloured rocks – or you could also try using a liquid paper pen). 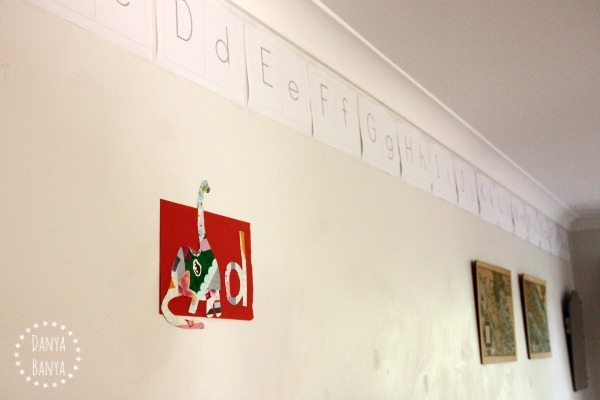 Some of the numbers are a bit hard to decifer, but that’s the point really – to give JJ a chance to practise her writing skills in a playful way. It’s also a good opportunity to see how she is going with her numeral recognition skills. The numbers 6, 7, 9, 10, 11 and 12 are tricky for her: she still can’t ‘read’ these numbers yet, but she works out what they are based on their position in the sequence. This was also a good chance to talk about and practise how to read an analog clock. We studied JJ’s white clock to work out where the numbers should go, and what length and thickness the hands should be. We used twigs for our rock clock hands, and talked about how we needed a short one for the hour hand and a longer one for the minute hand (and because her white clock also happened to have a second hand, we used a skinny twig to represent that too). We used a cute little pebble mouse that we’d made earlier, but you could use any sort of mouse toy. And then it came time to sing! We sang Hickory Dickory Dock all the way from 1-12. From 5 o’clock onwards, we just made up non-nonsensical rhyming words to fill in the blanks in the nursery rhyme (which JJ thought was hilarious). JJ helped the mouse run up to whatever number o’clock as we went along. These rocks now live in our backyard. The silver marks don’t wash off in the rain. 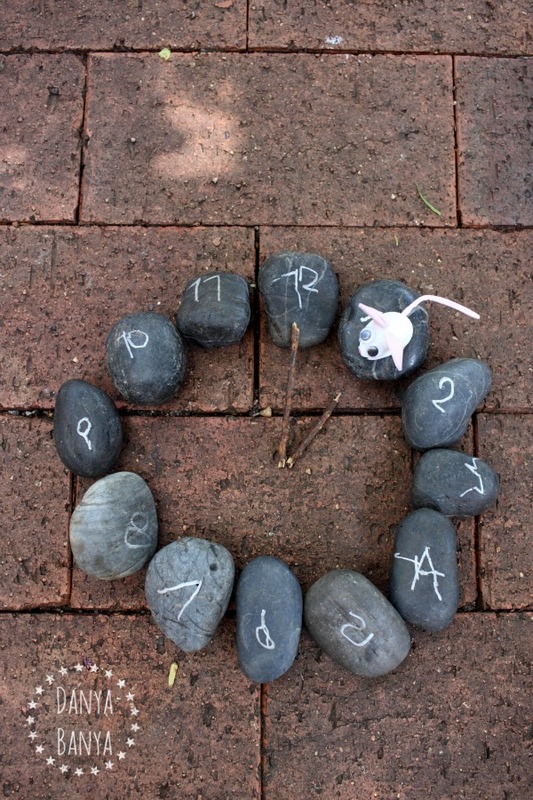 Usually our Rock Clock is just a pile of rocks off to the side of the garden, but every so often, I’ve set it up on the pavers outside, as a little invitation to play. 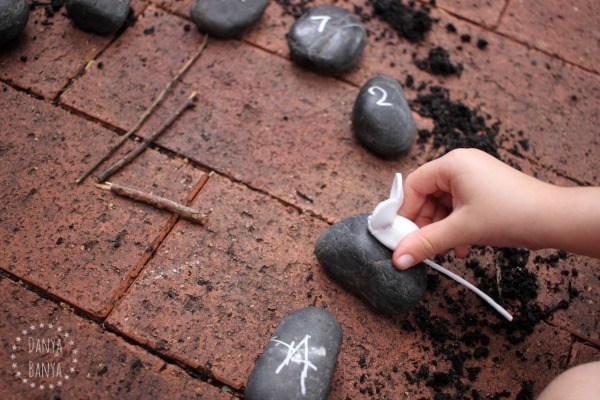 See below for some more fun ways to play Hickory Dickory Dock style! or practise geometry with these Hickory Dickory Dock Shapes from Teach Me Mommy. This is the first post for Rhyme Time! 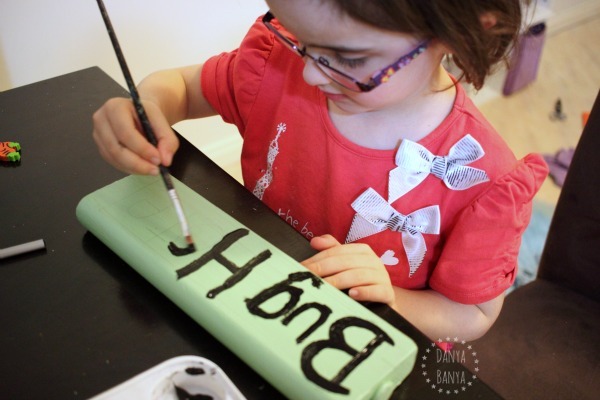 Every second Wednesday, my blogging buddies and I will each bring you a fun craft, game or activity to go along with a particular nursery rhyme. So make sure to pop back in a fortnight for our next nursery rhyme. Wonder what it’s going to be??? * This post contains Amazon affiliate link(s). An affiliate link means I may earn a referral fee if you make a purchase through my link, without any extra cost to you. It helps to keep this little blog afloat. Thanks for your support. 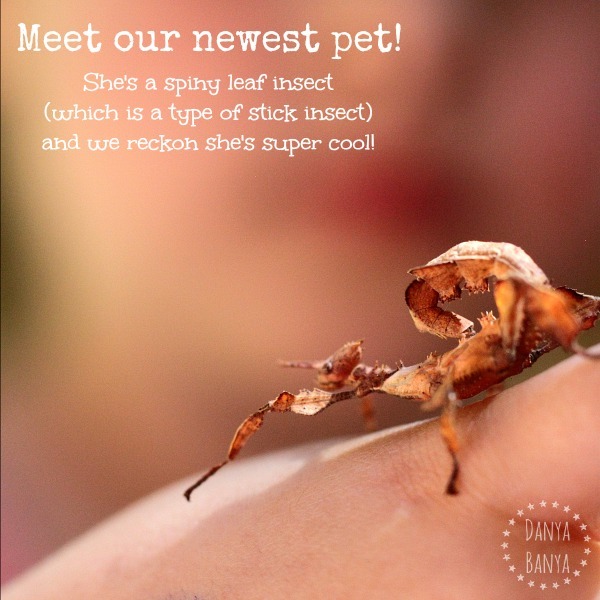 Spiny leaf insects (a type of phasmid or stick insect) make cool & easy pets for kids. Would also make a great classroom pet! The phasmids in these first few photos are girls. You can tell they are girls, because they have small (harmless) spikes along their back and tail. When they grow a bit bigger, they’ll develop small superficial wings (but they’ll never be able to fly). My toddler Bee is holding one of the young male phasmids below. You can tell he’s a male, because his back and tail are straighter and smoother. When he grows up, he’ll develop pronounced wings on his back, and he’ll be able to fly (although not very well). Phasmids are harmless. Their whole defence mechanism is camouflage. When they get scared, they freeze. And if they are really petrified, they start to rock in an attempt to look like a leaf gently swaying in the wind. At worst, when they walk on you, it tickles. 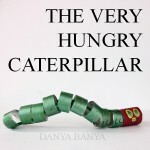 They don’t bite or sting, which makes them an ideal pet for young kids. 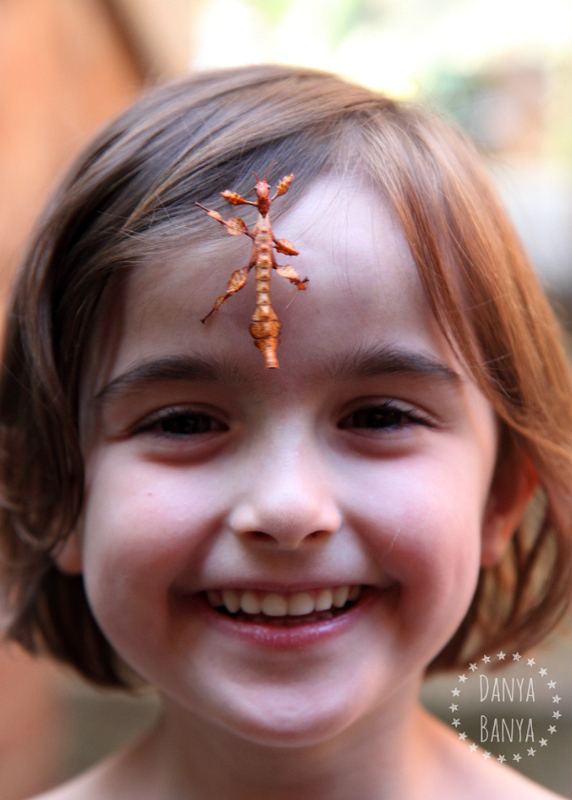 I brought our phasmids in to JJ’s preschool one morning, and the kids were fascinated! The only tricky thing is that they are rather fragile. 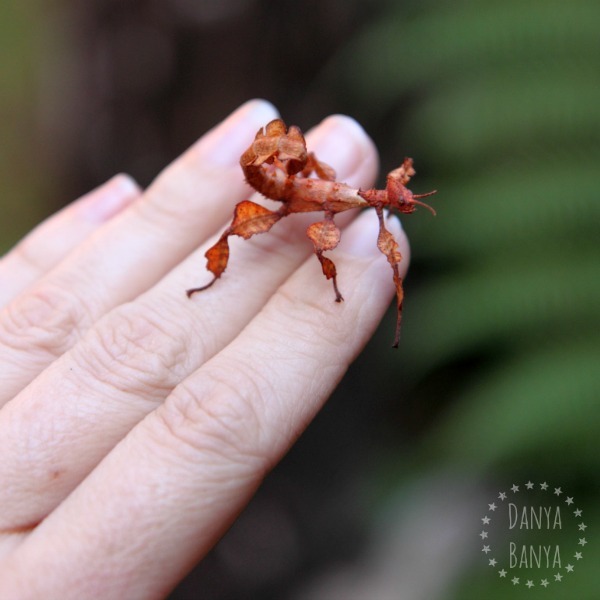 You have to teach kids not to use their fingers to pick phasmids up (lest they squish them or tear off a leg), but rather to put out their hand and let the phasmid walk on. Phasmids always want to move forwards and upwards, so if you just put your hand (or any other object) slightly above and in front of them, they’ll generally step up of their own accord. And they are very good at hanging on, and actually prefer to be vertical or upside down. To keep pet phasmids, you need three things: food, shelter, and water. 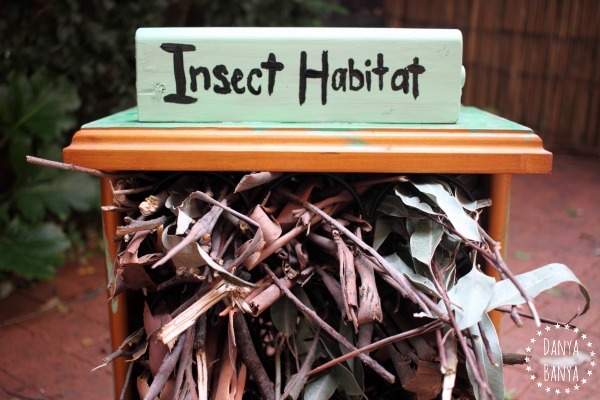 We feed our phasmids a small branch of fresh gum leaves from a eucalyptus tree. (I can often be found walking with a pair of secateurs sticking out of my back pocket, just in case we happen to pass a gum tree with low hanging branches). I try to choose branches that have a mix of young and old leaves, and if possible, I try to include some from different sources. The eucalyptus branches need to be put into a vase with a very narrow neck. We use a recycled capers jar because it is so tall and thin. There should be enough water inside the vase to keep the gum leaves fresh. The opening needs to be narrow to prevent the phasmids from drowning. I try to replace the gum leaves every second or third day, especially if it’s been hot and dry. Topping up the water in the vase keeps the gum leaves fresher, lasting up to a week. You know what’s really cool? 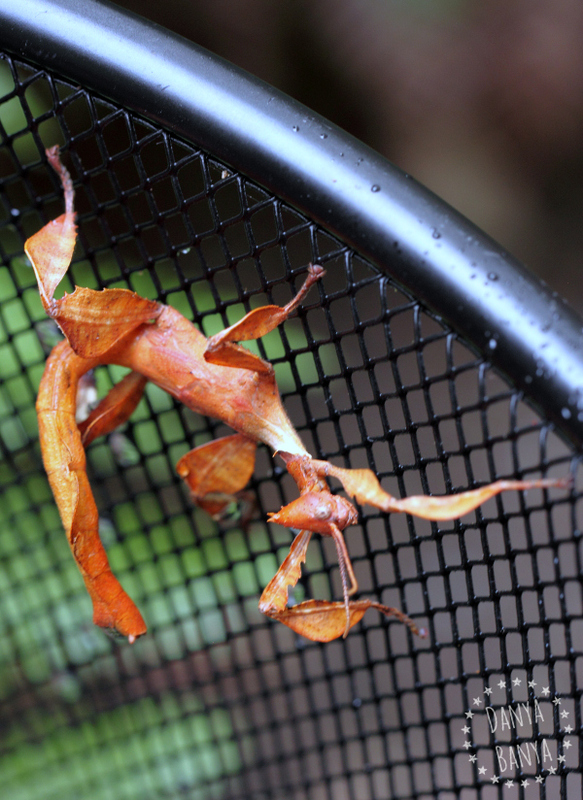 Our phasmids are an orange brownish colour, which is similar to the colour of dried gum leaves – perfect camouflage if you’re planning on living in a eucalyptus tree. I’ve heard that if you feed them rose, wattle tree or bramble leaves, the phasmids become a bright green colour, so that they would blend in better with their surroundings. So awesome! 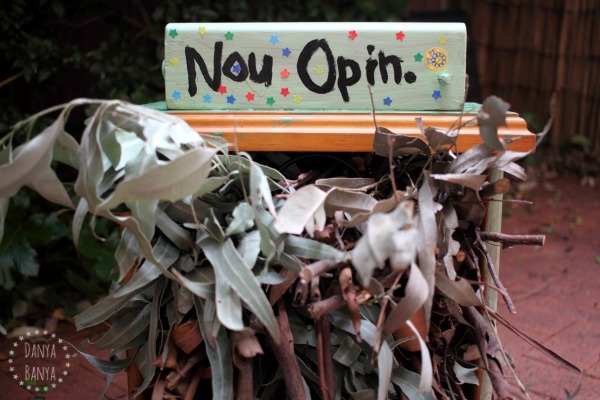 Then, all you need is a wire mesh waste paper bin that’s been flipped over. 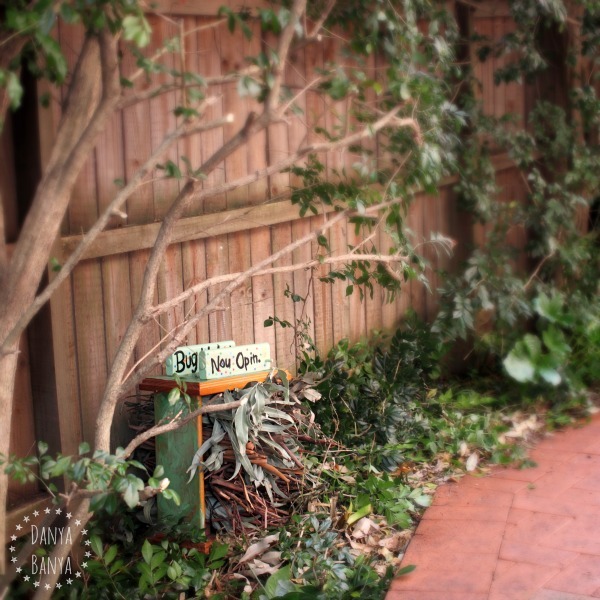 (I bought our bin on sale for less than $5 from Bunnings Hardware. It looks similar to this one *.) The wire mesh needs to be small and strong enough that the phasmids can’t escape, whilst still allowing plenty of airflow. As an extra precaution, I also place large stones around the base of the rubbish bin, to prevent it from accidentally tipping over. I chose a spot that gets plenty of shade from the harsh Australian sun. The base of the enclosure is the garden bed, with some clean sand for any eggs. Be careful also to choose a spot that won’t be exposed to bug spray or insecticides. (Make sure to ask your neighbours if they plan to do any spraying too). To change the leaves, I simply pick up the waste paper bin. 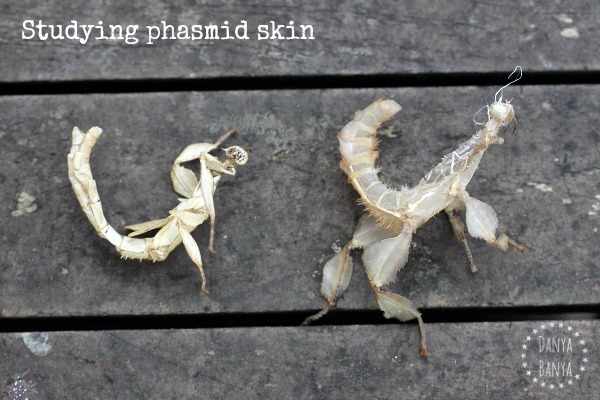 Most of the phasmids stay stuck to the underside, and the rest are easily transferred. 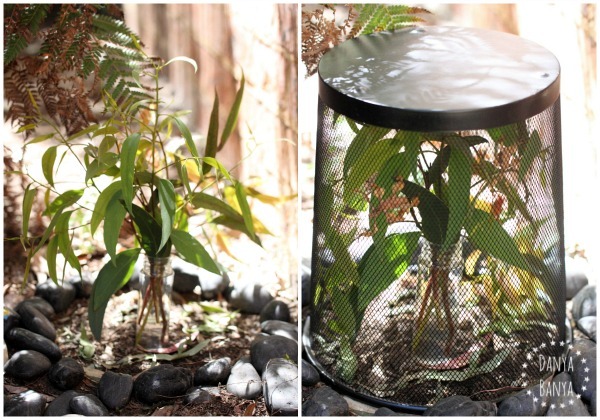 I put the waste paper bin to one side (still upside down), replace the leaves and water, and then put the bin (with the phasmids attached) back over the top. This waste paper bin enclosure will suffice while the phasmids are still young, but eventually you will need to upgrade to a taller option. I’m in the middle of designing a taller enclosure at our place right now. (I’ll show you pics when it’s finished). 3. How do phasmids drink? As I eluded above, phasmids don’t drink from large pools of water, and young phasmids can actually drown, so please don’t put a water bowl in your phasmid enclosure. Instead, simply spray your phasmids (through the wire mesh), and the phasmids will drink tiny droplets of water from the wet leaves. One of the cool things about female phasmids, is that they are able to produce fertile eggs without a mate. They can effectively clone themselves (called parthenogenesis), however all the eggs in this case will produce female babies. (If a female is able to find a male to mate with, only then will the eggs be a mix of male and female). We haven’t had any babies yet, but I’m hoping that we will soon, as our largest female is now mature. When the babies hatch, they are similar in shape to their adult form, as they don’t go through a larvae stage like other insects. As they grow, they shed their old skeleton (exoskeleton). 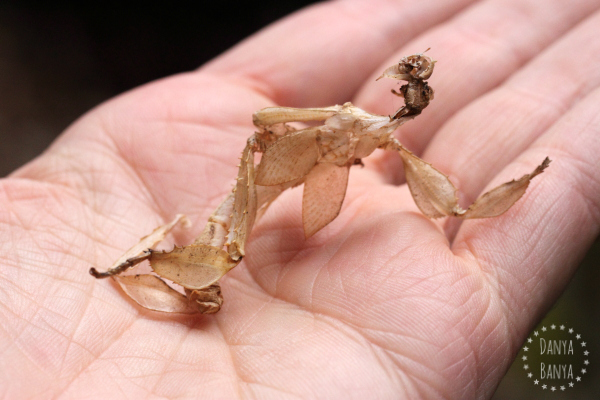 Phasmid exoskeleton is really cool for kids to study! On the left is the exoskeleton of a juvenille male. You can see long thin wings emerging. On the right is the exoskeleton of a juvenille female. This is the exoskeleton of a maturing female. You can see the emergence of two short (ineffectual) wing stubs on her upper back. Our largest female phasmid is mature enough to produce eggs, and I’m super excited about the prospect of little babies in the near future! 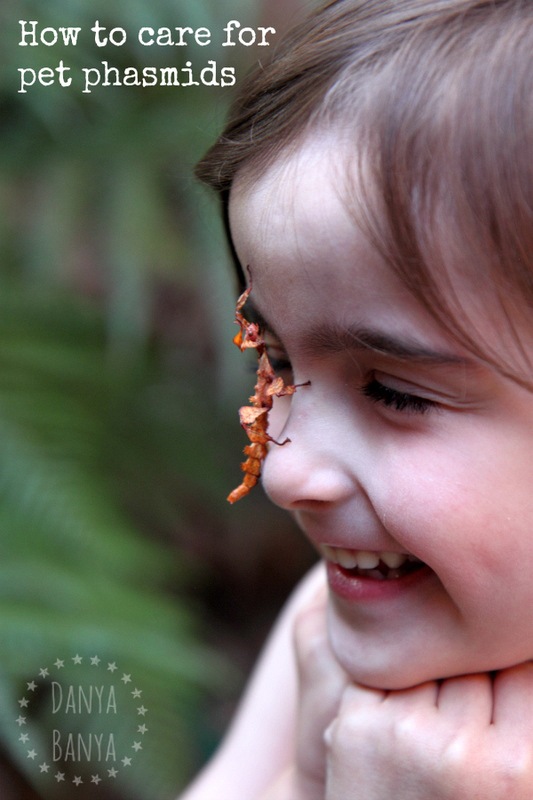 Care of Stick Insects by The Australian Museum is a great information source for keeping phasmids in a home or classroom environment. Phasmatodea on Wikipedia has a lot of very technical information about phasmids, their anatomy etc. 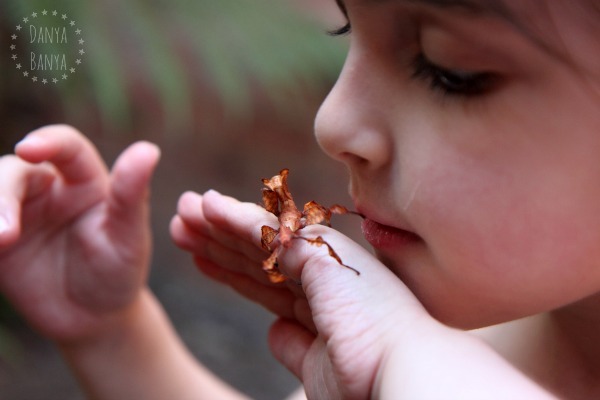 ABC’s Creature Features has a Spiny Leaf Insects page with a quick summary on caring for pet phasmids for kids. We received our spiny leaf insects from a friend who successfully bred them in her backyard enclosure. But according to the internet you can totally buy some from here. * Some of the products we have in Australia are not available internationally, so I’ve added in these (cheeky affiliate) Amazon link to help clarify. An affiliate link means I may earn a (tiny) commission if you make a purchase through my link, without any extra cost to you. It helps to keep this little blog afloat. Thanks for your support.